The show is housed in The Matford Centre, which is a huge single space but was absolutely packed with both exhibits/traders and visitors. High ceilinged is ideal, I guess, when you have lots of live steam; but plenty of space for lots of wheels to be stretched. (It turns out it’s a livestock centre, which is not only why there are hoses mounted next to many of the parking spaces, but also why the doors in the centre bear signs such as ‘prime cattle’). I had a short shopping list, but my main focus was on looking out for the budget live steamers on my shortlist – hopefully running, but at least ‘in the metal’ (I’ll post my shortlist very soon, informed by observations from the show.) Many of the layouts were in the nature of a couple of circuits around an operating well, with a few scenic items here or there – but to my surprise, with careful use of the limited scenic space available these often proved highly effective in creating atmospheric scenes through which some beautiful rolling stock could run and be admired. Of the larger layouts, Mendip Vale and High Reaches both oozed atmosphere, and St Genny’s struck an excellent balance between size and operational interest at 3m x 3m. Indian Hills is a fascinating model of the DHR with some beautiful locos running (both in detail and performance) and plenty of wild animals around the terrain they ran through! In addition, O gauge, gauge 1, vintage and modern (sound-equipped) track powered were represented. I ended up spending well over the 2 hours I promised my non-garden-railway-oriented companion was all I needed. Fortunately, we were not too late for a lunch at the Anchor in Cockwood which offers views of boats, views of the railway, and 20 different ways of preparing mussels. 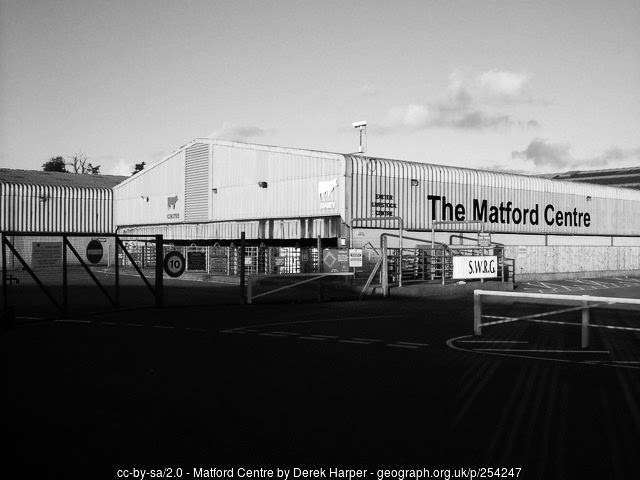 Image: Matford Centre (c) Derek Harper. Use under the CC BY-SA 2.0 Generic Licence.